He was born on December the 11th of 1898, in Englewood, New Jersey. He graduate form the same university as legendary Nick Galis has, the famous Seaton Hall. He is a professional basketball player since 2012. Playing for Antalya BB, Mets de Guaynabo, Huracanes del Atlantico, Merson BSB, JL Bourg, Fraport Skyliners, Banvit, Olimpia Milano. 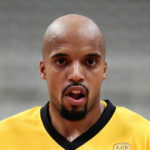 Since January of 2019 he wears the jersey of AEK BC. With the “Queen” he won the Intercontinental Cup. He was the finals MVP.